Melbourne scores 97.5 out of 100 and ranks first. Toronto scores 97.2 out of 100 and ranks fourth. Last week, three World Council on City Data (WCCD) Foundation Cities were included in the Economist Intelligence Unit’s (EIU) Global Liveability Ranking 2016, which according to the EIU “provides scores for lifestyle challenges in 140 cities worldwide.” Toronto, Melbourne and Helsinki, all ISO certified by the WCCD, ranked in the Top 10 of the well-publicised international city ranking. According to the annual index, Melbourne ranked as the number one city on the list with a score of 97.5 out of a possible 100, with Toronto coming in fourth place at 97.2. Toronto and Melbourne have always been regarded by leaders from both cities as close peer cities for comparative learning. With such a narrow difference between top-placed Melbourne and fourth placed Toronto, the WCCD has taken a closer look at what might account for the .3 difference and how liveability scores play out across WCCD ISO certified city data. What does the WCCD ISO 37120 data tell us? As a complement to the EIU’s Liveability Ranking, the WCCD has taken a closer look at what exactly separates Toronto and Melbourne, leveraging high-calibre, globally standardised data that conforms to ISO 37120 that both cities have reported to the WCCD on an annual basis. 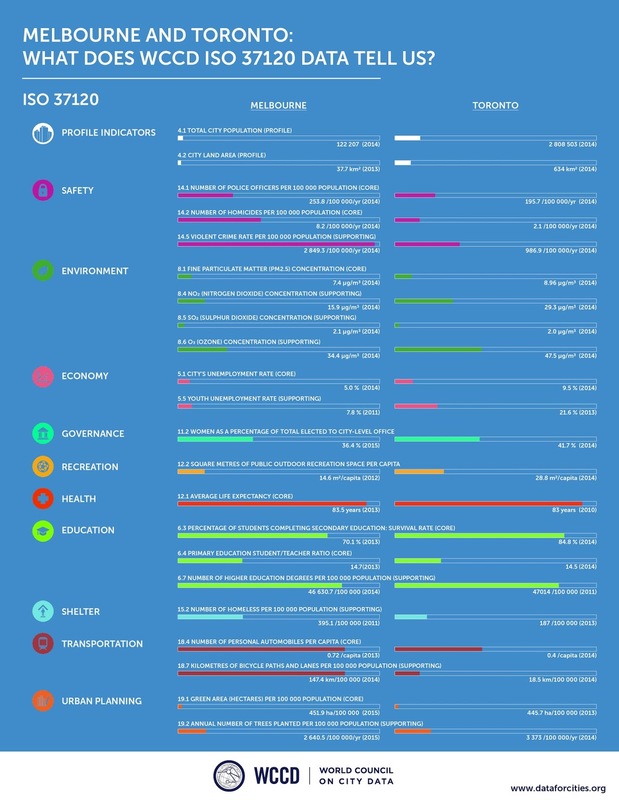 Toronto and Melbourne are very closely matched across a number of ISO 37120 indicators related to city services and quality of life. Generally speaking, Toronto performs better on safety, and Melbourne performs better on jobs. However, quality of life indicators for both cities are remarkably similar. Quality of education – a key measure of economic performance – is quite similar in both cities, through the lens of primary education student/teacher ratio, secondary school completion, number of higher education degrees. On air quality (as measured by PM 2.5 - particulate matter in the air) both cities record similar air quality numbers: 7.4Цg/m3 for Melbourne and 8.96 Цg/m3 for Toronto. What is the EIU Global Liveability Ranking? What is the WCCD ISO 37120 Data for Cities Initiative? The EIU’s liveability survey includes 30 qualitative and quantitative factors across five categories which include: stability; healthcare; culture and environment; education; and infrastructure. For qualitative factors (which are the majority), each city is assigned a rating by a group of EIU analysts and in-city contributors, with each factor rated as acceptable, tolerable, uncomfortable, undesirable, or intolerable. Unlike the EIU survey which relies on subjective assessment by experts, WCCD’s ISO 37120 indicators are solely data-driven and independently verified, as well as globally standardized – allowing for apples to apples comparisons. Both Melbourne and Toronto have been ISO certified by the WCCD, based on reporting data in conformity with ISO 37120 – the first international standard on city data. Other contrasting features: while the EIU draws on qualitative measures, the WCCD uses only numeric measures; while the EIU data and methodologies are not open to the public, the WCCD data is reported on an open data portal www.dataforcities.org; within the EIU’s methodology, it is unclear as to which geographic boundaries are used to demarcate each city - WCCD cities are defined according to official administrative jurisdictional boundaries—for example, for the City of Melbourne this means the area of 37.7km2 within the municipal boundaries rather than the larger urban area that may be commonly referred to as “Greater Melbourne”. For more comparative data on over 25 cities from around the world, visit the WCCD homepage at www.dataforcities.org. For more updates from the WCCD, please sign up to our mailing list here, and don’t forget to follow the WCCD on Twitter, Facebook, and LinkedIn.